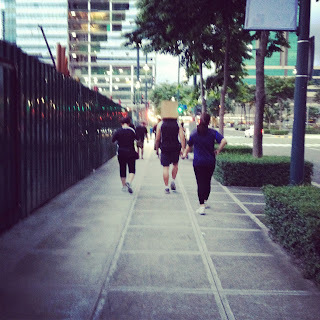 I took this picture when my kids and I were walking towards the starting line of Outbreak Manila 2 at the Bonifacio Global City. Yup! We did it again - ran like maniacs while dodging "zombies" so as to preserve our red flags. Was it fun? You bet! I, for one, was able to really run this time as the road was paved. In the first "Outbreak" held in Nuvali, the "road" was but a bike trail. However, the first Outbreak was better managed. It was funny how the route was peppered in spots with people watching us dodge and run. Hello? !